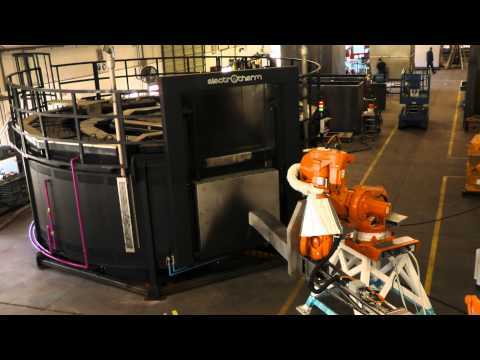 Electrotherm supplies continuous large rotary hearth furnaces for the mass producing forging process. Large rotary hearth furnaces are designed for continuous forging and ring rolling processes and assure temperature uniformity repeatability of not less than ±5°C (±9°F). Those types of furnaces allow quick set up and fast relocation due to the wheels installed. They are well known for their accuracy, reliability, high performance for a long period of time and easy and quick maintenance. The Large Rotary Hearth Furnaces offer seamless integration within the forging module – minimizing bottlenecks and allowing maximal efficiency of the press in one – piece – flow process. Electrotherm rotary hearth furnaces are perceived as best in the world due to the experience gained over many decades and based on profound understanding of its customer needs. Automation that can be synchronized with automation equipment for complete "production cell" which includes automatic transportation manipulators. Compact and independent cooling system for cooling the sealing oil. Automatic greasing system for hearth bearings. Special cast material grids/trays, to lay the load on the hearth. Automatic fire detection and extinguishment system installed and wired in the control cabinet, installed in all cells of the cabinet. Aluminum rotary hearth furnaces are designed for continuous pre-heat precision forging process.